If you thought the twist revealed in the last issue was something, then get ready to hop onboard for another ride. In issue 37 it was revealed the Liseth was part of the Red Tide (apparently we were supposed to understand that this was past tense for her, but I interpreted as a current status at the time). One can understand why Simon would find that so upsetting, to say the least. Here we get to see the reactions of everyone else, including Liseth’s mother. In response to the assassination by the Red Tide, Leader Vok has ordered a full on investigation/man hunt against them. Everyone is more or less working on their own methods of gathering information, though mostly Jess isn’t approving of Vok’s methods (to put it likely) The goal is to find Kesh Cur (hopefully alive) so he can face the punishment for his crimes. In the last issue Podfather Vob has falsely confessed to committing the murder, and I had assumed this was done to protect the rest of the Ungarans (sacrificing himself for the good of his people). Turns out it was a bit more selfish (I think?) than that. The Podfather blames himself for now allowing his people to die in honor (and quickly) on their doomed planet, as their religion required. He believes he is a coward, and this is his penance. I’m not really sure how I feel about that, to be honest. I understand his concern about his people being stranded on a planet full of people who hate them (the Red Wave certainly hasn’t made it welcoming for them), but I’m not sure death was the right option either. Then again, I do not know nor practice their religion, so maybe I don’t get a say. 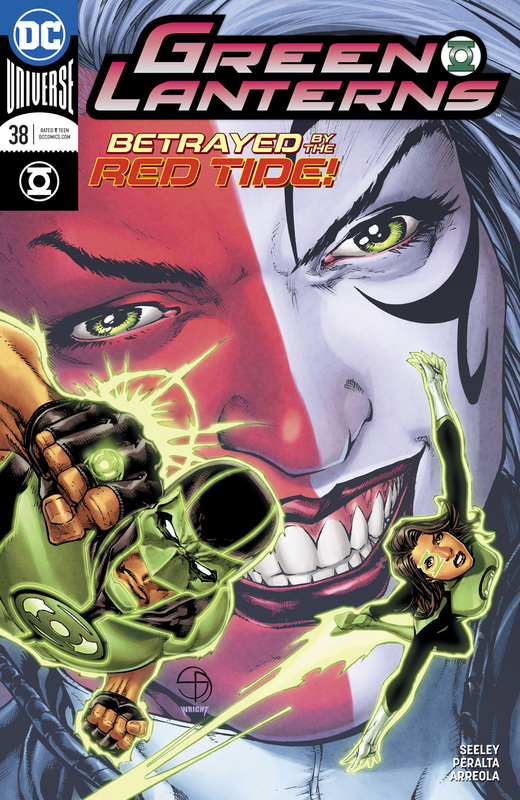 It’s rapidly becoming clear that what is going on here is a civil war of sorts (or at least the beginnings of one), which raises some questions about the Green Lanterns presence. Should they be here? Are they allowed to participate in politics so fully? Jess feels like the answer is no, while Simon is all for continuing to be involved; though to be honest I don’t think he’s seeing clearly right now (the whole relationship thing between him and Liseth and all). Having the location on hand, Vok orders an assault on the base, while Liseth begs to be allowed to come along. Now, personally I would not have allowed her to come. Her argument was very persuasive, but she’s already proven herself to be vulnerable to Cur and his sway, but that’s just my opinion, and it’s one that Vok doesn’t agree with. I’m surprised by how quickly things progress in this issue; I would have assumed the hunting/tracking down of Cur would have taken an issue or two, but instead they found his base rather quickly. This likely means that finding him will not conclude this plot and that there’s something worse looming just out of sight (as is usually the case). As predicted, there’s actually quite a lot more going on at this base than originally anticipated. I’m not sure why the rings didn’t detect it when scanning (assuming of course that they did a scan before entering the caves – it sort of seems like they didn’t). I know the connection likely wasn’t intentional, but Cur’s base very much reminds me of the one seeing in the Hal Jordan comics currently, the one being run by the Controllers. A coincidence or an intentional tie in, I can’t tell. I’m not sure how I feel about the whole Liseth plot, or where it’s going to go next. In some ways I feel that it was inevitable; they didn’t set her up in the manner of a long term character, which means she was meant to serve another purpose (or if she became a fan favorite they’d develop her further later). I think I’ll have to see what her next move is before I decide on the current set of events for her. Though I’ll admit it was an expected twist, in that I wasn’t anticipating a repeat of it. I absolutely loved the artwork for this issue; both Jess and Simon have such iconic looks to them, so when you add in the Green Lantern colors/uniforms and superhero poses, and you have two fantastic looking characters. Plus the way energy is interpreted/shown here was very striking (no pun intended) and I really enjoyed the detail and choices made for the pods shown at the end. There were some silly expressions made, but one could argue that they were intention, so I’m going to mostly overlook those.